Credit cards come with rules. You have to pay your bills on time. You have to spend within your limit. And you have to at least meet your minimum payments. Stick to those and any other obligations you sign up for, and you'll be OK, right? Wrong! If recent research is any indication, the major credit-reporting agencies may soon start examining your behavior in new ways to determine what products and terms they offer you. This could lead to less-attractive terms on your next loan - even if you've never actually abused your credit. On the last day of July, TransUnion, one of the big-three credit bureaus, published a study that examined the correlation between consumers making only minimum payments (or just a few dollars over), and the likelihood of their later defaulting on their plastic or other borrowing. And there is one! To be fair, co-author of the study Ezra Becker, vice president of research and consulting in TransUnion's financial services business unit, acknowledged in a written statement that to some extent he was stating the obvious, and had only "confirmed the conventional wisdom." He went on to explain that the report "has quantified just how big an increase in risk revolvers (those who don't zero their balances each month) represent." Quantifying risk is what credit bureaus live for. Once they can put numbers on patterns of consumer behavior, they can sell the products of the resulting statistical models to lenders. And that means those who usually or always fail to pay off their card debt each month may soon find themselves denied access to the lowest auto loan, mortgage and credit card rates. In reality, we could soon see a hierarchy, with those who zero their balances every month at the top, those who retain some balance but generally pay back a large chunk of what's owed in the middle, and those who routinely make minimum payments at the bottom. "This study is just the tip of the iceberg," Becker said. "Learning about payment patterns is critical in a marketplace that has once again become highly competitive across all risk tiers." Transactors: those who always zero their card balances (42 percent). Revolvers (Partial): those who pay more than the minimum on at least one of their credit cards, but don't zero their balance (40 percent). Revolvers (Min. 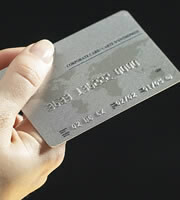 ): those who routinely make within a few dollars of the minimum payment due on at least one of their cards (18 percent). Revolvers who receive a new bank card today are more than three times as likely as transactors to be 90 days or more past due in two years. For existing bank cards, they're more than five times as likely. For auto loans, they're three times as likely. What's remarkable is that existing credit scores don't accurately reflect this difference in risk. As you'd expect, a tiny proportion of super prime borrowers (those with credit scores over 900) find themselves 90 days or more past due on their auto loans 24 months after those loans originated. But some do, and they're roughly twice as likely to be revolvers than transactors. Credit bureaus' promises to help lenders make smarter decisions are generally welcome, because when people who truly can't cope with borrowing are given finance, everyone suffers. But, as recently highlighted, using big data to segment groups, and then to judge individuals because they happen to share certain habits, is bound to involve some unfairness. Some revolvers are inevitably going to be responsible borrowers who'd never default in a million years. So profiling them in this way is going to disadvantage the innocent as well as the "guilty." It would be better to assess an individual's creditworthiness on his or her own records rather than on the ones of those who happen to be like them in certain ways. But maybe that's not possible. Drivers with DUIs or bad claims records rightly pay higher auto insurance premiums. But we accept that young people must do so too, because of their group's statistical propensity to be involved in more collisions. Perhaps we have to see lending in the same way. 0 Responses to "Your credit card habits could soon impact your credit in new ways"